Wiggle, wobble, balance, spin, stack and roll. Why not get a stacking toy that you will love as much as your toddler? This clever toy is one of the easiest to play with, but also conducive to some very complex configurations when piled by a more skilled user. This makes it great for all ages, and one of those toys that is equally enjoyed by children as young as 12 months, their older brothers and sisters, and even mom and dad, or grandma and grandpa. When a toddler plays with these, they will find it easier and more rewarding, because the pieces stack better, fall over less often, and allow them to build taller towers. This sturdy building toy will be easy for them to use while they are young, and able to grow with them as they advance. As soon as an older child or adult picks these up, they begin to challenge themselves, and push the boundaries as they stack and balance each piece to see what is possible. Because each spherical block is textured, weighted, and uniquely shaped, they can be aligned in many ways and at a multitude of angles. No longer do stacks need to be completely vertical or only include right angles. These rounded stackers will allow for curving and bending as you build higher and higher to create most precarious towers. The vibrant, modern look will have children engaged instantly, and the endless fun, constant challenge and immense replay value will have them coming back over and over again. The brightly colored spheres, with their multi-color motif, are fun to look at, but get one in your hand and the reward is even greater. They feel great and have a heft that screams quality. A dual texture design and variation in sizing only adds to the appeal. Younger children will explore the roughness to discover the differences, and older kids will realize the grip the texture creates, and appreciate the traction created. This heaviness, gripiness and size variation makes each piece easier to stack, but also fun beyond the pile. As children play and explore, they will learn that Tobbles are also fun to spin, roll, balance, wobble and more. 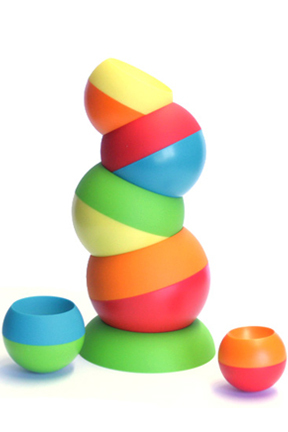 Because careful attention was paid to the design of this stacking toy, each piece is perfectly weighted for ease of use, and maximum versatility of design. A concave portion on one side allows the pieces to nest as they are stacked, so they remain more sturdy, and younger kids are able to stack higher than expected. One of the most fun things about building a tower of blocks, is knocking it over to start again. What isn't fun is when a tower topples over right when it is getting good. This stacking toy for toddlers not only makes it easier for young ones to achieve the tall tower, it also adds fun and variety to how they are able to interact with it once built. Instead of just pushing it over, kids can spin and twist the tower, or shift and wiggle each piece. They can cause the pile to bend and sway, or make the pieces curve instead of stand straight. Of course they can still be clobbered and demolished once it's time, but with Tobbles, your child is almost guaranteed to experiment and investigate rather than just witness the destruction. Tobbles will help children refine gross motor skills, enhance spatial relationships, and improve overall hand-eye coordination. This unique set of stacking blocks will also encourage creativity, allow for experimentation, and engage kids in hours of innovative play as they discover all of the different ways to play with them. The vibrant coloration will help teach children primary and secondary color spectrums, as well as keep them interested as they stack. The differing sizes of blocks will teach concepts related to size and number sequencing, and relationships like bigger and smaller or taller and shorter. Because there is two different textures on each sphere, young children learn to identify the difference, and older ones make the connection with what benefits this adds to the building process. Beyond sizing differences, there is also a unique weight to each piece. THis aspect is great for function when stacking but also important in teaching children the concept of more or less, as they identify which piece is heavier than the other. These concepts come easy when they are naturally learned through play instead of drilled by lesson or instruction so this toy is perfect for educating and entertaining at the same time. Tobbles are a fun and educational toy that children will love playing with and parents will feel good about. It is incredibly dynamic in its design, and high quality in it's construction, so the possibilities for play are endless. Little hands will delight in the never-ending discovery that is Tobbles. For most homes it becomes a design-savy conversation piece that provides every member of the household with hours of abstract fun. Revel in the enjoyment your toddler will have building with this set, but don't feel bad when you spend an hour on your own creation after bedtime. The versatility and amazing design make this toy perfect for a 12 month old, but also incredibly entertaining for older kids and adults too. Physics interplays with design perfection to create a stacking toy that looks good, and plays even better! 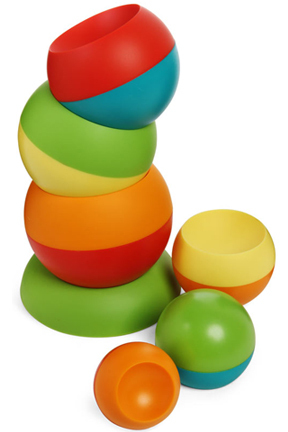 Includes six colorful, weighted spheres & one stacking base. Features high quality construction and full safety testing. For ages 1-99+. If you would prefer a similar toy that is better for younger children, then check out Tobbles Neo. Order Yours Today! Dimensions (l x w) n/a - each sphere is a different size. Overall height is dependent upon design. 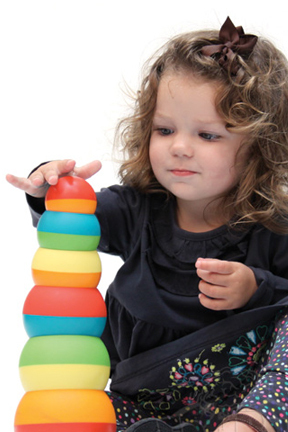 Tobbles Stacking Toy - Equal amounts of fun for toddlers, older siblings and parents alike. 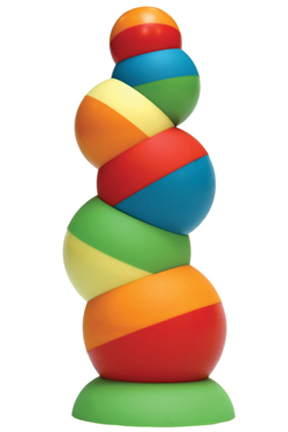 This is more than just a stacking toy as each piece can wobble, spin, balance roll stack and more. Order Yours Today! Clean Your Home or Office Without Harsh Chemicals.